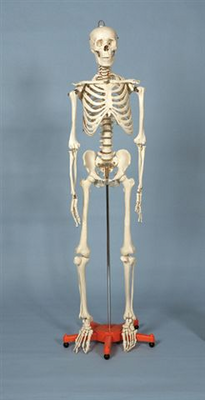 Skeleton FULL SIZE 5' 6"
Home > Drawing Supplies | Art Mannequins, Skeletons & Other Drawing Models | Art Skeletons | RICHESON Skeleton FULL SIZE 5' 6"
RICHESON Skeleton FULL SIZE 5' 6"
RICHESON Skeleton FULL SIZE 5' 6" This is an anatomically correct plastic skeleton which is a perfect choice for figure drawing. It is very life like and the legs and arms are removable. The joints are designed to replicate normal human movements and the jaw opens and shuts. The skeleton comes with a stand which can be used for display. Half of the skull can be taken off. This is a great choice for learning how to draw skeletons and also can double as a prop for Halloween or parties. It is also a great option for a medical or doctor’s office. Very lifelike and stands at 66” (5’6”) with a total weight of 35 lbs.